So it is at long last that Call of Cthulhu, Seventh Edition, is a reality. The venerable and inaugural roleplaying game of Lovecraftian investigative horror receives not only a new edition, but also an update and an upgrade—and proper updates and upgrades in either case. For this is not a mere case of intermittent creep between reprints or makeovers of the current rules with relatively minor changes in the rules, an issue that has beset previous editions of Call of Cthulhu. Rather Call of Cthulhu, Seventh Edition is a full rewrite and design of the game, the mechanics, and how the game is played, arguably something that it has not been given in some two decades—if not longer. In the process, the designers—Mike Mason and Paul Fricker working from the earlier editions designed by Sandy Petersen and the late Lynn Willis—have sought to address some fundamental issues that have arisen in over thirty years of game play, to make the game more accessible, and more attractive to an audience of the twenty-first century. The result is a relatively radical redesign whose differences—despite it fundamentally being compatible with previous editions of the game—have proved to be slightly contentious given the game’s thirty year history and whilst they may not necessarily be to the taste of every player or Keeper, they do make sense. Published by Chaosium, Inc. after a very successful—although subsequently difficult—Kickstarter campaign, the very first thing that you notice about Call of Cthulhu, Seventh Edition is that rules have been split into two books—the Call of Cthulhu Investigator Handbook – A Core Game Book for Players and the Call of Cthulhu Rulebook. Of these two, the Call of Cthulhu Investigator Handbook focuses upon everything that a player needs to play Call of Cthulhu, Seventh Edition—barring a clear and simple explanation of the rules—including investigator creation, skills, a wide array of investigator Occupations, and historical background. All that without being exposed to the secrets of the Mythos and its effects that are detailed in the Call of Cthulhu Rulebook. It is this book that is being reviewed here. Just as with the Call of Cthulhu Investigator Handbook, the Call of Cthulhu Rulebook is presented in full colour—here a soft blue as opposed to the sandy tan of the Call of Cthulhu Investigator Handbook. The use of colour is not extensive, but the use of double page spreads at the start of each chapter gives the book a certain grandeur, whilst the use of pages torn from a notebook to hold sidebar text gives a sense of marginalia, of extra esoteric details added by an ‘occult expert. For the most part, much of the first fifth of the Call of Cthulhu Rulebook is the same as the Call of Cthulhu Investigator Handbook, but there are differences enough to make reading one of these books after the other less of a repetitive experience. So whilst there are overviews and examples of play in both books, each is slightly different. What is noticeable by its absence in these opening pages is H.P. Lovecraft’s ‘The Call of Cthulhu’. Indeed there is no fiction present at all, that being left to the Call of Cthulhu Investigator Handbook and its inclusion of ‘The Dunwich Horror’. Now this is lamentable, but given the limitations of the space in the book and the amount of material that has to go into the book, it is at least understandable. Cthulhu Mythos’ examines the author and his influences, the creation of the Cthulhu Mythos, the development of the Mythos before and after his death, and the Mythos itself. Others author covered include August Derleth, Robert Bloch, Ramsey Campbell, and more, but the focus is soundly on Lovecraft himself. That said, it does not deal with the more reprehensible aspects of Lovecraft’s character and thus his fiction, but that is probably best left for another discussion. Notably what it does highlight are the decisions made by Sandy Petersen in designing the Mythos for Call of Cthulhu, essentially stripping out the ‘war in heaven’ concept that has the Great Old Ones battling the Elder Gods, the arbitrary division of these ‘gods’ into good and evil, and the association of the elements with certain Great Old Ones. The result was, and is, starker, more ‘Lovecraftian’, and more evocative of Cosmic Horror as well as being satisfyingly familiar. The investigator creation rules in the Call of Cthulhu Rulebook are the same as those in the Call of Cthulhu Investigator Handbook, but with a stripped down list of Occupations—less than thirty as opposed to the hundred or so in the Call of Cthulhu Investigator Handbook. So whilst it is perfectly possible to create investigators using the rules found in the Call of Cthulhu Rulebook, the Call of Cthulhu Investigator Handbook gives more options. Similarly, the list of skills is almost the same as in the Call of Cthulhu Investigator Handbook, the additions being mostly more mechanical details for each skill—the effects of ‘pushing’ that skill and setting some opposing skill difficulties as guidelines for the Keeper. At its most basic, Call of Cthulhu, Seventh Edition is mechanically no different to previous editions of the game. It uses percentile dice to roll under a value—typically a skill, an investigator’s Sanity, and so on. These values are joined in Call of Cthulhu, Seventh Edition by an investigator’s attributes, now expressed as percentile values rather than between three and eighteen. The values have also been graded—Regular for under the full value, Hard for under half of the value, and Extreme for under a fifth of the value—for easy determination of the difficulty of any roll and the success of its outcome. This has also been supported by the new character sheet which has space for all three values for all of the game’s attributes and skills. The new rules encourage increased player agency. Prior to a skill roll, the player and Keeper can agree upon the possible outcome of a successful skill roll. If the skill roll is successful, the player can narrate the outcome, but if the roll is failed, then the Keeper narrates the outcome. This agency does not apply to every situation, and similarly, it does not always apply to the new type of roll in Call of Cthulhu, Seventh Edition. This is the capacity to ‘Push a Roll’. This addresses the issue of failure in previous editions of the game wherein if a player failed a roll, there was no way around the problem and this could be an issue when the investigator was trying to find an important clue, such that the Keeper would have to find a way around this roadblock in order for the game to progress. In Call of Cthulhu, Seventh Edition a player can ‘Push a Roll’. What this means is that if a player fails a roll, then he can roll again. He needs to explain what his investigator is doing differently to earn the right to Push a Roll and he also needs to negotiate with the Keeper what the consequences of failure are. This is not a rewind of events, but rather a second, desperate attempt. For example, Sergeant Install is a bomb disposal officer working to deactivate a bomb that has been attached to the underside of the driver’s seat of a nice Mercedes. Unfortunately, the car’s owner, Mr. Alexander is sat in the car, unable to move lest the device detonate. Sergeant Install has Demolitions 70%, and because the bomb is in an awkward place to get at, the Keeper rules that the Difficulty of the task is Hard, or half the skill. So in Sergeant Install’s case, this will be 35%. Unfortunately, his player fails the roll. Sergeant Install’s player decides to push the roll, explaining that the Sergeant will draw upon his previous experience with this type of device to determine the correct course of action. The Keeper accepts this and together they negotiate the terms of possible failure—the countdown will suddenly speed up. Fortunately, Sergeant Install’s player makes the roll and both he and Mr. Alexander are safe. Combat rolls cannot be Pushed in this fashion, but like the right to narrate the outcome of successful skill rolls, ‘Pushing a Roll’ is another storytelling mechanic. Most obviously it is a means to get around the problem of failed rolls, but it has another effect—it makes the play of the game less black and white, giving a greater flexibility in the outcome of skill rolls and so moving Call of Cthulhu towards a slightly pulpier feel. Examples of Pushed rolls and the consequences of their failure are given for each skill in the skills list. Lastly, ‘Pushing a Roll’ is not the only means included in Call of Cthulhu, Seventh Edition to counter failed rolls. There is also Luck. This is probably the most controversial new mechanic in Call of Cthulhu, Seventh Edition. In the new rules, it is a stat or attribute that is rolled just like the Luck roll was in previous editions of the game, but in Call of Cthulhu, Seventh Edition, Luck is also a resource that can be expended to improve rolls, for example, from a failure to a Regular success, from a Regular to a Hard success, and so on. This does not include attempts to ‘Push a Roll’, on which Luck cannot be spent in this fashion. When Luck is spent, it is on a one-for-one point basis and once spent, the points are gone and the Luck stat is permanently reduced, although it can be recovered at the end of a scenario or campaign. It should be made very clear that this expenditure of Luck is an option. Neither the Keeper nor his players have to use it in their game. What its use does though is move—much as ‘Pushing a Roll’ does—Call of Cthulhu towards a pulpier style of game in which there is a little more give in terms of investigator survival. In a sense, when spending Luck, an investigator is ‘pushing his luck’ and quite literally, his luck can ‘run out’. In play Luck actually becomes a resource to be managed, the player judging when the time is right to ‘push his luck’, more judgement being used in an ongoing campaign game than in a one-shot or convention where he will throw caution to the wind and is unlikely to play that investigator again. Just as Call of Cthulhu, Seventh Edition has made changes to the core mechanics and skills, so too have changes been made to combat. Whilst the DEX rank means of determining initiative has not changed, the first change is to fist and melee fights to avoid the ‘back and forth series of attacks and dodges’ of the previous editions. Now in a fist fight, the attacker and defender make opposed Fighting (Brawl) skill rolls with the better roll determining who is successful and can thus inflict damage. What a combatant cannot do is attack and parry—all of that is figured into the single roll. A combatant can also dodge and this again is handled with opposed Fighting (Brawl)/Dodge skill rolls. In a stand up fight, draws favour the attacker or the defender if he is dodging. This also applies to the use of melee weapons. In a brawl, combatants effectively get two actions—once when they attack and then again when they defend. If a combatant has already tried to attack and then tries to dodge an attack, then he does so with a Penalty die. What this means is that fist fights and melees are faster—in terms of telling the story, if not necessarily mechanically—because investigators get to roll twice in a round, once as an attacker and once as a defender with possibility that an investigator might roll well and inflict damage in both instances. Where melee combat consists of opposed skill rolls, ranged combat, including firearms, does not, primarily because combatants are not acting on the same initiative order or able to react with the same immediacy as in a fist fight. In fact the only reaction a combatant can have is to dodge—as he throws himself to the ground or ducks behind a wall—and that is all that he can do. The most obvious change to the rules for shootouts is for weapons that can be fired more than once in a round. They still can, but every shot after the first is with a Penalty die. The autofire mechanics receive the most attention and seem workable enough, though as with any set of autofire rules, they are bound not to satisfy everyone. What comes across throughout is that combat and damage are deadlier than before. Primarily because characters can suffer major wounds—damage equal to, or greater than half of a character’s Hit Points—which will knock them prone and possibly render them unconscious. Then because attacks made at Extreme level of success inflict maximum damage, including the Damage Bonus, if a blunt force trauma attack, but maximum damage, plus a damage roll, if an impaling attack such as a knife or a gunshot. Further, it takes a long time to recover from any damage—the First Aid skill only grants a single Hit Point back and the Medicine skill requires time and rest upon the part of the injured investigator. Lastly, options are included for hit locations, knock-outs, spending Luck to remain conscious, suppressed fire, and more. Overall, the combat rules feel relatively simple and straightforward. Notably though, they are very nicely illustrated with some fully worked out and very helpful examples. Inspired by ‘The Shadow Over Innsmouth’, the chase mechanics in Call of Cthulhu, Seventh Edition get their own chapter. This abstracts the route of the chase into a line of dots—or locations—along which the Keeper can track the progress of both the investigators and the NPCs. All of the participants in a chase get a minimum of one action or Move each round, but the faster of them will get more. These Moves can be used to move forward; to mount an attack—using the Fighting, Firearms, or Drive (Auto) skills; cast a spell; overcome hazards—traffic jam, patch of mud, a fence, or even two men with a pane of glass, and so forth. All of which use the game’s main rules as normal. So far so good. The chase rules are a reasonable attempt to cover a common situation, but two problems arise. First, when a chase involves multiple participants or splits into more than one chase, they become more complex for the Keeper to keep track of. Second, when vehicles are used they use the same rules, but the only stat for vehicles that matter in a chase—when determining movement and the number of Moves available—is their Move stat. There is no stat that accounts for a vehicle’s mechanical handling, that would make it better at performing maneuvres. Now Call of Cthulhu, Seventh Edition is not Car Wars, but given the advances in technology and the differences in vehicles in both the 1920s and the modern eras, it seems an odd omission. Naturally, Sanity is as important to Call of Cthulhu, Seventh Edition as it to previous editions of the game. Mechanically, the Sanity rules have not changed, but they have been rewritten for clarity. Primarily this has been done to make clear what an investigator’s mental state is, whether that is suffering from temporary, indefinite, or permanent insanity and which phase of the reaction to a sanity depleting experience he is in—‘A Bout of Madness’ or ‘Underlying Sanity’. If in the former phase, the player still passes control of his investigator to the Keeper as in previous editions and the investigator may come to later on to find himself in a perilous situation—as shown in some terrific examples. If the latter phase, then the investigator is more prone to suffering from delusions or the effects of an existing phobia or mania—thus making it easier to portray either under both normal and insane circumstances. The effects of insanity are also applied directly to an investigator and his backstory. Essentially exposure to the Mythos can alter aspects of an investigator’s backstory—his physical appearance, ideology and beliefs, relationships with significant people, meaningful locations, treasured possessions, and personal traits. The exact Sanity warping or corrupting effect of exposure to the Mythos to these elements is a matter of negotiation between the player and the Keeper, but the Keeper is also free to add new elements to an investigator’s backstory. Lastly, one of these elements—an investigator’s key connection—can be relied upon for comfort and succor in times of mental stress. Perhaps a religious investigator goes on retreat or one who values his parents spends time at home. Either way, the investigator may regain lost Sanity this way—though woe betide an investigator who loses such a key connection. Fortunately, losing a key connection is fairly difficult and cannot be lost at the arbitrary whim of the Keeper, it must be played out within the game. Over all, the Sanity rules feel little changed. They do however, feel better explained, more organised, and thus streamlined. Where they are definitely improved is in the number examples that show how they work and in showing how insanity directly affects an investigator through the elements of—or roleplaying hooks from—his backstory. Now this may feel familiar from other RPGs, perhaps even other RPGs of Lovecraftian investigative horror, but this does not mean that they are not needed or unwelcome in Call of Cthulhu. The oddly named ‘Playing the Game’—surely this chapter should have been called ‘Running the Game’ given that the Call of Cthulhu Rulebook is primarily for the Keeper?—is full of advice pitched along two different lines. The first is for those Keepers new to Call of Cthulhu, whilst the second is for those Keepers who are new to Call of Cthulhu, Seventh Edition. Thus the advice covers setting up a group, setting up a scenario, creating investigators and investigator groups, handling and portraying NPCs, making the most of an investigator’s backstory, and even corrupting the investigator’s backstory via the Mythos… It also goes over the mechanics—when to roll the dice, ‘Pushing a Roll’, ‘Pushing a Perception Roll’, and so on. In some ways it feels very basic, but that is born out of familiarity rather than contempt. Nevertheless, it is in this chapter that the Idea Roll makes its appearance in Call of Cthulhu, Seventh Edition. No longer is it up front and part of the investigator creation process or on the investigator sheet. Here it has been relegated to a roll of last resort, when the players have been run out ideas and have no idea what to do and so want to hand the fate of their investigators to the Keeper. Importantly, whatever the roll, the investigators get the clue or spur that they need, but if the r0ll is failed, they are placing their fate in the hands of the Keeper. This is in keeping with the story driven outcomes of failed rolls for ‘Pushing a Roll’, suffering a ‘Bout of Madness’, and so on. The ‘Grimoire’ of spells has been expanded to allow for ‘deeper’ versions of various spells. Such versions are typically known by insane wizards, but it is possible for an investigator to learn such versions when he too is insane—either temporarily or indefinitely. For example, Body Warping of Gorgoroth enables the caster to alter his shape and appearance, whether to that of an object or another person, but the ‘deeper’ version lets the caster change himself into a true replica of another person.In addition, the chapter also explores the idea that its many spells can be redesigned so that the Keeper can create one more suited to his game. The example development of Create Zombie into Graveyard Kiss, Grey Binding, and Create Zombi illustrates the flexibility of the idea. Nevertheless, the spells will be familiar from previous editions of Call of Cthulhu, as are the selections of Mythos Tomes, artefacts and alien devices, and monsters, beasts, and alien gods. There are changes here and there. For example, the Mythos Tomes can be read again and again to gain more understanding of the Mythos, but this takes longer and longer each time with diminishing returns each time up to a maximum amount that can be learned. Another change echoes the efforts of Sandy Peterson, the original designer of Call of Cthulhu to declutter the Mythos away from the supposed ‘Good/Bad’ leanings of various Mythos entities and races, and that is the removal of the classifications for said entities and races. Thus in Call of Cthulhu, Seventh Edition, they are no longer explicitly categorised as Independent Races, Lesser Servitors, Greater Servitors, Elder Gods, Outer Gods, Great Old Ones, and so on. This is primarily because H.P. Lovecraft was himself inconsistent about the application of such categories, particularly the Elder Gods, Outer Gods, and Great Old Ones. The effect is to free up how the Keeper both thinks about and uses these entities in his game, although for those not new to the game, the ‘monster’ classification of the older editions of Call of Cthulhu is discussed as an option. *At this point I wanted to write Great Old One, but such a term is optional under Call of Cthulhu, Seventh Edition. **Anyone with access to The Primal State, the Miskatonic University Library Association Monograph available as a PDF should consider adding ‘Amidst Ancient Trees’ to that mini-campaign. The second scenario, ‘Crimson Letters,’ takes place at Arkham’s famed Miskatonic University and in Call of Cthulhu terms, is much more of a traditional investigative affair. The investigators are called in to look into the circumstances of the death of a young university professor who died under mysterious circumstances to ensure that there is no ensuing scandal. The scenario comes with various NPCs and locations and is more of a sandbox than the structured affair that is ‘Amidst Ancient Trees’. What this means is that there is a lot more preparation required by the Keeper and this not helped by the sizeable cast of NPCs and motivations that he will have to handle. The scenario would also certainly have benefited from a jumping-off or starting point for the Keeper to work from and thus provide a hook for the investigators. Overall, as good as ‘Crimson Letters’ has the potential to be, it does feel a bit too much like a tool kit for the Keeper rather than an actual scenario. Whilst there is nothing intrinsically wrong in changing the scenarios from one edition of Call of Cthulhu to another, neither scenario feels right for the Call of Cthulhu, Seventh Edition Rulebook. In the hands of an experienced Keeper both scenarios are perfectly fine, but for the inexperienced or neophyte Keeper both represent a challenge, especially ‘Crimson Letters’ which possesses a complexity that is arguably too much for a scenario in a core rulebook. The first problem essentially is that neither is really an introductory scenario—or just quite an intermediary scenario if the Keeper and his players have played ‘The Haunting’. The second problem is that both scenarios are written with the experienced Keeper in mind, that is, the traditional audience who has been playing Call of Cthulhu for as much as thirty years or more, though more so in the case of ‘Crimson Letters’ than ‘Amidst Ancient Trees’. Arguably, these scenarios are the only real misstep in the Call of Cthulhu Rulebook. Their inclusion and the lack of scenarios designed to ease a Keeper—whether a Keeper new to Call of Cthulhu or just the new edition—into running Call of Cthulhu, Seventh Edition is both disappointing and out of step with the effort made by the rest of both the Call of Cthulhu Investigator Handbook and the Call of Cthulhu, Seventh Edition Rulebook to both teach and showcase the new rules. Rounding out the Call of Cthulhu, Seventh Edition Rulebook is a set of extensive appendices. These include a glossary, a a conversion guide from previous editions to Call of Cthulhu, Seventh Edition, equipment lists, rules summaries, and more. Physically, the Call of Cthulhu Rulebook suffers from the same organisational oddities as the Call of Cthulhu Investigator Handbook. Where that volume has the ‘Life As An Investigator’ and ‘Advice For Players’ chapters separated by a chapter on ‘The Roaring Twenties’, here the chapter on Magic—covering the reading and study of Mythos Tomes and the learning and casting of spells—is separated from the subsequent chapters that detail the Tomes of Eldritch Lore and the Grimoire of spells by the chapter on running the game, itself oddly named ‘Playing the Game’. So there is an odd bump in the narrative flow of reading and learning the game and again, a organisation that is not as logical as it should be. That said, the Call of Cthulhu Rulebook is physically well presented and comes with some decent artwork, although various pieces are somewhat scrappy and lack the assured atmosphere of the old pen and ink pieces of the previous editions of the game. Although the editing wavers towards the book’s end a little, overall the Call of Cthulhu Rulebook is well written, the rules benefiting greatly from the efforts of the authors to explain the rules through copious examples—to the point where there are almost too many examples. In coming to the end of any review it is usually a simple matter of drawing it to a close with a simple conclusion. This is not possible with what is a radically new and different take upon as venerable a game as Call of Cthulhu. Thus this review will draw not one conclusion, but several in pulling together my thoughts about Call of Cthulhu, Seventh Edition. Most obviously, the biggest changes to Call of Cthulhu, Seventh Edition are its mechanics. Their effect is to move it towards the Pulp style and feel, but it is not a wholly Pulp style game. Certainly ‘Pushing a Roll’ does move the game towards the Pulp and arguably away from the uncaring nature of a Lovecraftian universe, as does the expenditure of Luck and various other optional rules, but apart from ‘Pushing a Roll’, all of these are optional rules. In other words, the Keeper and his players does not have to use them. It is at best, slightly pulpy, and should a Keeper want a more Purist style of game, then the best option would probably be to ignore the optional rules. On the other hand, combat is now deadlier than before and healing greatly slowed, so the survivability of an investigator does feel as if has been substantially reduced. Which certainly makes it feel more like a Purist game and may be seen as a counter to the slightly pulpy ‘Pushing a Roll’ mechanic. Of the optional rules, being able to spend Luck to adjust dice rolls has the most noticeable effect upon how people play Call of Cthulhu. This is because Call of Cthulhu, Seventh Edition turns Luck into a valuable resource, one that can be spent to effectively push an investigator’s luck and when low after having been spent, reflects the fact that an investigator’s luck really has run out. Now in a convention game or one-shot, Luck is there to spent. After all, the scenario will be over in four hours and that investigator is never going to be played again, so a player can be more daring, perhaps devil may care, with the life of his investigator. Luck though exacerbates this feeling, whereas in a campaign, Luck becomes much more of a precious resource, with limited refreshes of it at the end of scenario or part of a campaign. So Luck is something to be hoarded rather than spent, a player saving it until the moment when his investigator really, really needs it. What this means is that in an one-shot game, Luck makes a scenario much more of a Pulp game than a Purist. Another side effect of the publication of Call of Cthulhu, Seventh Edition is that it fosters ‘edition wars’, that is, disagreements between one version of a game and another. It is perhaps more prevalent between versions of Dungeons & Dragons and of Old School Renaissance ‘retroclones’, but the differences between Call of Cthulhu, Seventh Edition and its previous iterations are enough to inflame one over your favourite version of Call of Cthulhu. Whatever you feel about Call of Cthulhu, the game has been in print—more or less—for over thirty years and in that time it has been very well supported with a lot of highly playable material. Of course the publication of the new edition will mean that those previous editions of the game will no longer be supported, but that it is less of a handicap than some might think. Call of Cthulhu, Seventh Edition is compatible with the previous editions and vice versa. If a Keeper and his players can handle simple arithmetic, then running any scenario for Call of Cthulhu under Call of Cthulhu, Seventh Edition will not be a challenge. The extra preparation required by the Keeper will not add much to the extra required to ready a scenario anyway and for the most part, a Keeper could run any almost any scenario published in the last thirty five years without any difficulty or even preparation, whether that is from The Asylum and Other Tales, The Stars Are Right, or Tales of the Sleepless City. It means that old material is still available and accessible and playable using Call of Cthulhu, Seventh Edition. It means that your library of Call of Cthulhu books, campaigns, and scenarios and the material contained in them are still valid and definitely have not made redundant purely because of the publication of a new edition. 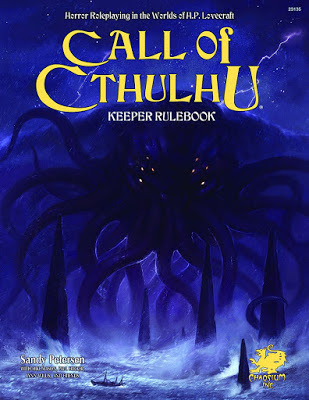 * Likewise, a Keeper can just as easily take a scenario for Call of Cthulhu, Seventh Edition, for example, Cold Harvest or Dead Light, and run it using Call of Cthulhu, Sixth Edition, Call of Cthulhu, Fifth Edition, and so on. *It is fair to say that there are exceptions. For example, The 1920's Investigator's Companion, Vol. 1, 1920's Investigator's Companion, Vol. 2, and The 1920's Investigator's Companion are all redundant with the publication on the Call of Cthulhu, Seventh Edition Investigator Book. So at this point in the review, I want to step away from the analysis of the Call of Cthulhu Rulebook and talk about my emotional response to the new edition of the game after playing it several times. I was a play-tester—like many people—and I was a Kickstarter backer—again like so many people, and of the playtesting groups, we were the only ones to record those sessions. In playing both through the playtest sessions and various games since, at no time has it never felt like I was not playing Call of Cthulhu. True, it felt fiddly in places and the Investigator sheet looked fussy, but this never translated into play. Nor did any of the investigators I played feel less or more competent. In places the rules did feel slightly more complex, especially the Chase mechanics and whilst investigator creation looks more complex, the numbers are simple and the choices of Occupations excellent—especially if you have the Call of Cthulhu Investigator Book. However, I do have strong feelings about the changes to the content of the Call of Cthulhu Rulebook. Simply, I am saddened by the omission of the short story ‘The Call of Cthulhu’ and the loss of the scenarios—‘The Haunting’, ‘The Madman’, ‘Dead Man Stomp’, and ‘Edge of Darkness’. Of course, I still have them in previous editions of the game, but a Call of Cthulhu rulebook without them seems lacking. Penultimately, in reviewing Call of Cthulhu, Seventh Edition, there is the matter of the title of these reviews—‘Call of Cthulhu II (Part the First)’ and ‘Call of Cthulhu II (Part the Second)’. It is the ‘Call of Cthulhu II’ that is important here, for although the reviews of both the Call of Cthulhu Rulebook and the Call of Cthulhu Investigator Handbook, are together a review of Call of Cthulhu, Seventh Edition, arguably they are not Seventh Edition at all. Rather they are Call of Cthulhu, Second Edition—the real Second Edition and not the one published in 1983. For all of the editions published between 1981 and 2005—from Call of Cthulhu to Call of Cthulhu, Sixth Edition, are really one game with just minor changes between editions, a contention only exacerbated by the number of minor editions released for the Fifth Edition. The publication of Call of Cthulhu, Seventh Edition is a radical design in comparison to those previous editions, it is as a thorough a rethink of the way in which the game is played as it has ever received. * It is as thorough a reexamination of the rules and the issues of the rules as the RPG has ever had and indicates a major step in the game’s evolution and history. Ultimately, the question you have to answer is this… “Should Call of Cthulhu, Seventh Edition have been just another reprint with minor tweaks made to the rules and a new layout that pleased no one, or should the designers have actually addressed issues with the game that had arisen after thirty years of gaming?” The question hardly warrants an answer, because it cannot be denied that Call of Cthulhu needed an update, a redesign, a rethink—and not just because it was being funded via Kickstarter. The resulting Call of Cthulhu, Seventh Edition has been updated, redesigned, rethought, and the end result is a far more resilient, more nuanced game, but with options included to allow a Keeper to run the game how he wants. If the designers of Call of Cthulhu, Seventh Edition had to get one thing right it was addressing the issue of failed skill rolls and in the ‘Pushing a Roll’ mechanic, the designers absolutely have. The mechanic is simple, elegant, and in keeping with the designers’ efforts to give the players greater agency during the game. This is balanced by the granting of agency back to the Keeper when ‘Pushing a Roll’ or an Idea roll are failed. The other mechanical changes evolve from previous editions of the game and are logical and standardised, making the game easier to learn and play. Call of Cthulhu, Seventh Edition is also easier to learn because the rewriting of both the Call of Cthulhu Rulebook and the Call of Cthulhu Investigator Handbook includes copious examples of the rules and play, and all together, Call of Cthulhu, Seventh Edition is more accessible for Keeper and player alike. The fact that it is an evolution of the previous rules, means that the thirty years of previous supplements, scenarios, and campaigns are still accessible and playable using Call of Cthulhu, Seventh Edition, yet Call of Cthulhu, Seventh Edition is also a great jumping on point for the game. Whilst Call of Cthulhu, Seventh Edition brings many changes to the venerable RPG of Lovecraftian investigative horror, this is without fundamentally changing what Call of Cthulhu was—and is, the preeminent RPG of Cosmic Horror.